Clear your calendar, ignore your to-do list, and slip on your silliest socks. 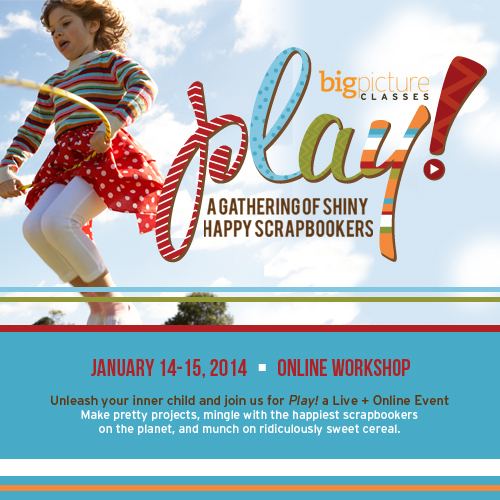 You deserve a brief escape from the pressures of your daily life—into the world of Play! Join us inside this special online classroom, where seven of our top teachers will inject a playful spirit into your photography, your storytelling, your scrapbooking-page designs, and your life in general. We recorded 9 hours of inspiration and instruction at our live Play! event in Anaheim, California this January. And now it’s all available to you. This series of seven inspiring classes—with accompanying bonus videos, handouts, and downloads—will fill you to the brim with enough fun and frivolity to make 2014 your most playful year yet. Keynote address from Stacy Julian, recorded live in Anaheim. See for yourself why Stacy is such a sought-after inspirational speaker to audiences worldwide! Keynote + class from Ali Edwards. Watch her inspirational keynote message and follow her lead to create a Project Life mini album that’s your year-long resource for playful storytelling. Keynote + class from Tracey Clark. Enjoy her breathtaking slideshow, watch her live-broadcast presentation on “playful photography,” and then complete a fun photo scavenger hunt. Class from Heidi Swapp. Watch Heidi’s inspirational keynote address that had our live and online audiences in tears, and learn about her latest product line. Class from May Flaum. Learn playful techniques demonstrated by May live in Anaheim and create the ultimate playful page with help from May’s downloadable how-to handout. Class from Elise Blaha Cripe. Learn to carve your own rubber stamp, and then use it to make a personalized set of notecards. Class from Tammy Tutterow. Explore your artistic side with a fabulously fun mixed-media project. Watch as Angie Lucas and Wendy Smedley interview our favorite manufacturers as they show off their latest products from the CHA tradeshow. Complete supply lists and downloadable project worksheets for each project class. Interaction with hundreds of fellow students via the private message board and gallery. Forever access to the complete classroom, in case you want to come back and watch any of the keynotes, classes, or presentations again.